A few years back, we purchased a motion sensor camera to put in the woodlands behind our house – strictly for fun. It is amazing to see what we capture from time to time living and roaming in the wild. Turkeys, raccoons, our cats, and more. 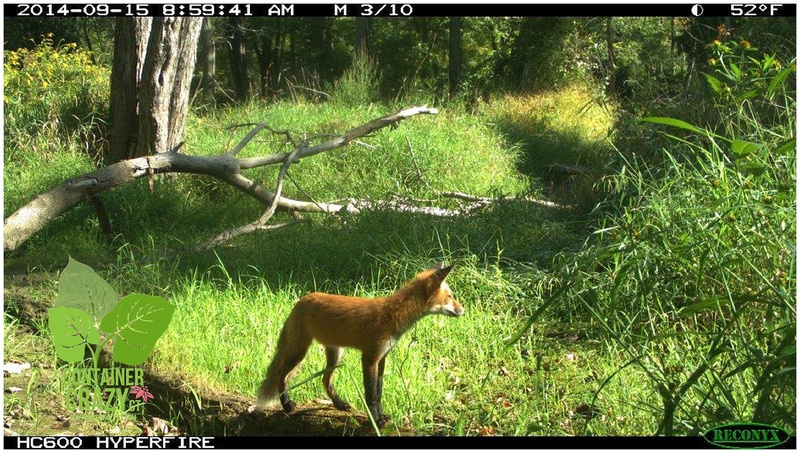 Two recent visitors have been this fox below, and a buck. I know foxes live out in the woods beyond our backyard, and I recognize their barking sounds. They sound like a dog with a scratchy voice. I’m sure my chickens are not liking their visits – I can imagine the foxes scan the coop’s pen from time to time when we don’t know it. One year, a momma fox and her two babies hung out in our yard quite a bit. I was sitting on my porch, quietly sipping coffee, and the momma fox came right up near me suddenly, not knowing I was there – and she had the nerve to yelp at me a little because she was startled when she saw me. I yelped back, because I was startled too, and quickly ran back into the house. 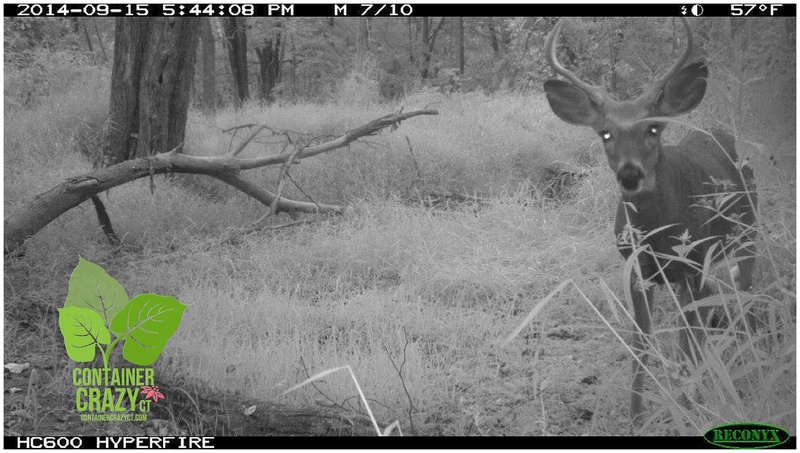 And this buck, in the photo below, was also captured by the camera this week as he slowly walked up to the camera to investigate it – they are smarter than we think. This shot is particularly cute with his inquisitive eyes. He is seeing the blinking red light which flickers when a photo is taken. We got many snapshots of him on the camera, but I picked this one to share this morning. Deer use our backyard as a passage way – the Scantic River runs beyond our property and with the wetlands and many trees, they enjoy the woodland areas. One year, a little deer in the backyard showed up, so I snuck up with a camera to take a photo, using the pool as a shield as I approached her. I got rather close to the deer – but she didn’t run away. My father later told me to never do that again, deer can attack, he stated. People will complain about deer munching on their garden plants – but I guess because there is plenty for them to forage on in the woodlands, they don’t seem to bother my landscape plants much, but I certainly would be annoyed if they attempted to munch on my plants in my container gardens scattered around the yard. Sometimes, in the winter, they may try to bite a bit on some holly bushes in the front landscape area of my house, but it doesn’t happen often. Thankfully. There are many critters around here in my backyard – raccoon, fox, and deer are common visitors. This spring, a family of raccoons took up residence in the garage attic – How did they get in? Through the pet door for our cats! It was not fun eradicating the momma raccoon and her 3 babies. Afterwards, the pet door got shut off for a while until we resolved their regular visits. I really don’t mind the wild visitors in my yard – they bring a sense of calm when you quietly witness them walking around and enjoying their surroundings – so long as they leave my six hens alone – they are welcome! It is all part of enjoying nature, and as this autumn approaches and we witness the change of the leaves, feel the cooler breezes, and listen to the quieter evenings no longer filled with the sounds of crickets and frogs, I guess we will welcome our wild friends along with the change of seasons. ← Plants Never Give Up – So, Why Should We?